Students completing the Dual Credit at Home Study Plans study 13 subjects and most choose to take the 13 corresponding CLEP and DSST exams. CLEP exams are produced by The College Board (also the producers of the SAT test), and DSST exams are owned and administered by Prometric. BONUS RESOURCE: Get our free dual credit e-book to learn how our family has saved over $300,000 on college degrees! Students may earn the high school credits without taking the official exams for college credit. In our own family, once our students had completed the studies on the subject and were passing the practice exams we awarded the high school credit. The college credits are earned when they take and pass the official exams at a testing center. These earned college credits may be applied to a student’s degree plan when they enroll in a particular college/university. Knowing that school’s credit-by-exam policy will help you determine whether or not your student needs to take the official exam for credit. Every college has their own policies regarding which CLEP and DSST exams they accept for credit and the total number of credits a student may earn using exams. If your student has a particular college in mind, know their policy. It may be that your child will study a Dual Credit at Home subject for the high school credit only and not take the official exam because you know in advance that it won’t transfer to that particular school. More and more students are choosing accredited colleges that are credit-by-exam friendly; these colleges (particularly Thomas Edison State College and Charter Oak State College) allow students to apply all 51 earned credits directly to their general education requirements and/or use them as electives. The American Council on Education’s College Credit Recommendation Service (ACE CREDIT) has evaluated and recommended college credit for 38 DSST courses and 33 CLEP exams. The American Council on Education is the major coordinating body for all the nation’s higher education institutions. One more thought before we look at each course/exam in the Dual Credit at Home program. HSLDA states here that “Generally, a one-semester three-credit college course is equal to a year-long one-credit high school course.” Because we homeschool in Texas, we apply these credits in keeping with our state’s law. We encourage you to know and follow your state’s homeschool laws with HSLDA being a great resource for that. 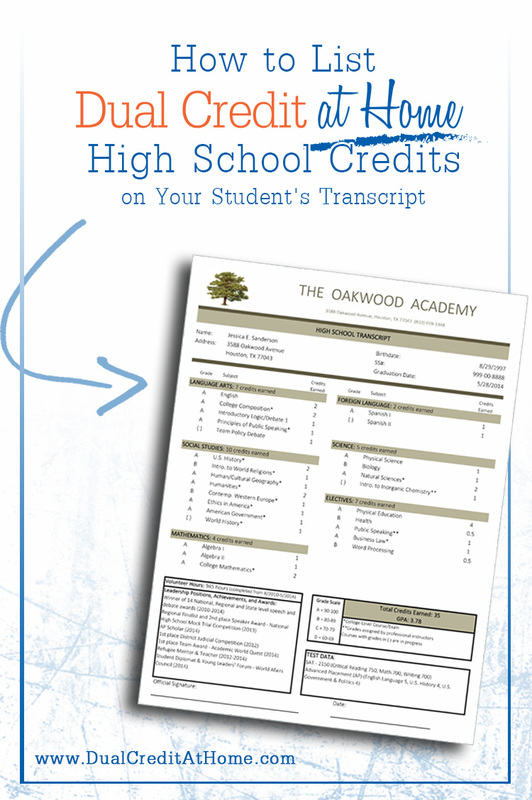 Now let’s look at each course that Dual Credit at Home students study and see how each of these can be shown on your student’s high school transcript. Natural Sciences – The Natural Sciences CLEP exam covers both biological sciences and physical sciences and earns 6 college credits. Therefore, we give our students one high school biology credit and one high school physical science credit. After the eight weeks of Study Plans covering these topics are completed, students are prepared to pass this college-level exam. As usual, once they successfully complete the studies and are passing the practice exams, we award high school credit. If a lab is desired, a student might consider also taking a lab course at a junior college or home school co-op. Introduction to World Religions – We include this DSST exam, worth 3 college credits, to fulfill college general education requirements in the areas of Human Cultures and/or Global Understanding. One high school credit may be awarded, and we reflect that credit in the Social Sciences with the course title Introduction to World Religions. American Government – Studying for this 3-credit CLEP exam and passing the practice tests earns a student 1 high school credit for the subject titled American Government. We show this credit in the Social Sciences section of their transcript. College Mathematics – The College Board states “The College Mathematics examination covers material generally taught in a college course for nonmathematics majors and majors in fields not requiring knowledge of advanced mathematics.” This is a 6-credit CLEP Subject Test and earns your student 2 high school math credits. Typically, if your student is headed toward an engineering degree, computer science degree, or any other degree that involves higher maths, you probably want them to have higher high school maths as well. Social Sciences/History – This CLEP exam is another 6 credit Subject Test and earns your student 2 credits in the Social Sciences. The College Board states, “While the exam is based on no specific course, its content is drawn from introductory college courses that cover United States history, Western civilization, world history, government/political science, geography, sociology, economics, psychology, and anthropology.” You may break these 2 credits up in several different ways. Here are some possibilities: World History – ½ credit, Sociology – ½ credit, Economics – ½ credit, Psychology – ½ credit. Your student will have already earned their U.S. History credits with the U.S. History CLEP exams and their American Government credits with their CLEP American Government exam. Their geography credit will be earned as they prepare for the following DSST exam. Human/Cultural Geography – Your student’s studies for this 3-credit DSST Social Sciences exam can be shown on their high school transcript as Geography or Human/Cultural Geography and earns 1 high school credit. Principles of Public Speaking – This 3-credit DSST Humanities exam can be shown as a Principles of Public Speaking course in the Social Sciences section of the high school transcript. As a 3-credit college course, you may award 1 high school credit. Humanities – The College Board states, “The Humanities examination tests general knowledge of literature, art, and music and the other performing arts. It is broad in its coverage, with questions on all periods from classical to contemporary and in many different fields: poetry, prose, philosophy, art, architecture, music, dance, theater, and film.” Your student’s completed studies for this 6-credit CLEP exam earns 2 high school credits. You may show those credits in several ways. Possibilities include: Humanities – 2 credits, Visual Arts – ½ credit, Performing Arts – ½ credit, Literature – 1 credit. Ethics in America – This 3-credit DSST Humanities exam can earn your student 1 high school credit. It covers what can be controversial topics and is a great subject to study while your teen is still in your homeschool. DSST states, “This exam covers topics including ethical traditions and analysis in various relationships, embryonic stem-cell research, euthanasia, affirmative action, and capital punishment.” The course is usually shown as Ethics in America in the Social Sciences section of the high school transcript. College Composition – The College Board states, “The College Composition examination assesses writing skills taught in most first-year college composition courses. Those skills include analysis, argumentation, synthesis, usage, ability to recognize logical development and research.” Preparing for this exam earns your student 2 high school credits as this is a 6-credit CLEP Subject Test. You may choose to show these studies as courses titled Writing, English, Composition, etc., and distribute the credits among those courses. Along with these core subjects parents choose to add other courses such as foreign language, PE, music, computer, electives, etc., to fulfill state requirements. FREE ONLINE WORKSHOP: Want help compiling an impressive high school transcript? Attend my free online workshop and get a free transcript template, too. Register now! I hope this info answered any questions you had about how to apply the high school credits your student would earn as they complete the 49 Study Plans. There’s also a free downloadable, Excel transcript template right here on our website.